I’m getting close to a wrap on this series of posts about my trip to Canada last summer. This photo is of a monumental cowboy sculpture at the Calgary Stampede, which is probably the best known rodeo, or what is otherwise billed by the promoters as “The Greatest Outdoor Show on Earth.” It’s sort of a combination of a rodeo show, a massive county fair and a Canada-centric display of regional pride. The rodeo itself is a daily competition with the usual events, such as roping and riding, but with one addition that sets it apart from many other such events. The Calgary Stampede includes wagon races, which harken back to the wild west. The wagon races begin with the team, which includes two on the wagon and outriders on horseback, putting away a kettle in the back of the wagon to represent cowboys breaking camp. The wagons then weave around barrels before racing around the perimeter of the rodeo grounds. It’s a charming evocation of rural western culture. For most people the highlight is the bull riding, which is brutal, impressive and dangerous. I’m quite sure that we saw one young rider suffer a serious shoulder separation getting thrown from a bull. An interesting cultural twist is that some of the best bull riders are from South America, which has a cowboy culture all it’s own. In the evening there is a stage show with music, dancing and singing. I don’t know if the theme changes each year, but the show we saw was focused entirely on all things Canadian. I actually learned some things about Canada that I didn’t know. For example, which of the four major professional sports was invented by a Canadian? Nope, not hockey. It’s basketball. Ironically, there is only one NBA team in Canada, which is the Toronto Raptors. On the other hand, Canadians represent the second most non-American NBA players in the league. A highlight of the show was the inclusion of aboriginal tribal leaders dressed in traditional costumes. So, cowboys and “indians” all around. Aside from the rodeo itself, the grounds include lots of other activities you might find at a county fair, and a lot of barbecue. There are several stages with musical acts to keep things lively. It’s definitely worth seeing if you plan on visiting Alberta. A lot of good, clean fun, and a noticeable lack of over-celebration when it comes to alcohol. Oh, and while you’re in Alberta, be sure to go to one of the steak houses. The Alberta beef is fantastic, if you enjoy a good steak. I took this photo in Glacier National Park, Montana. This is Lake Josephine, in the area of the park called Many Glacier. We were in the park July 9 & 10. The timing was fortuitous because a fire required closure of some areas shortly after we left, including part of Going to the Sun Road. As is so often the case, this photo doesn’t really capture the beauty. My daughter and I agreed that Glacier National Park was a highlight of the trip. 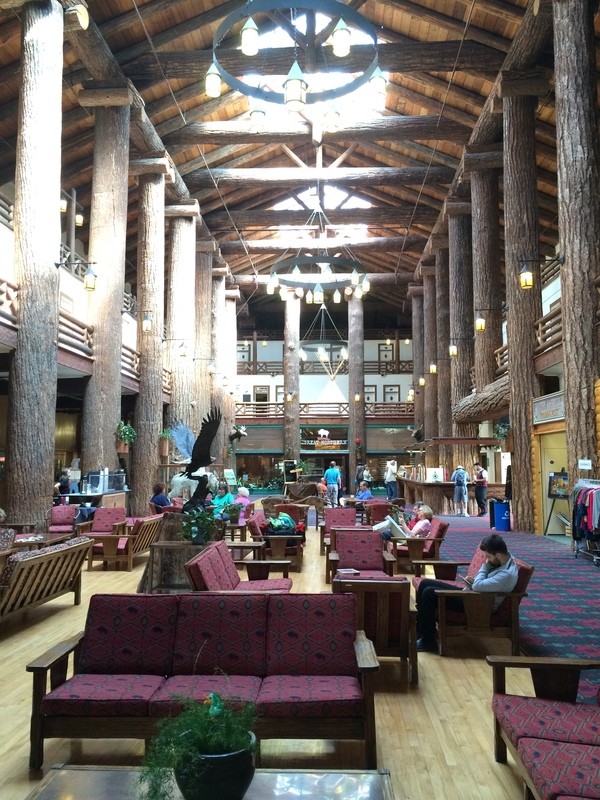 We didn’t have reservations for lodging in the park itself, so instead we stayed nearby in an old school hotel called the Glacier Park Lodge, which opened in 1913. The lodge was constructed by the Great Northern Railroad as part of an effort to bring tourists to the park by train. The rail line still runs right by the hotel. Here’s a photo I took of the lobby. Those giant columns that look like tree trunks…are tree trunks. Most of the structural supports are timbers of varying sizes. When we checked into the hotel there were a few details that went unmentioned. For example, there are no televisions in the rooms. Also, no phones. There is wi-fi, but the signal is weak, so if you want to use it you need to go to the public areas. This lack of technology creates a time warp effect and the guests resort to Victorian entertainments like board games, cards, and jigsaw puzzles that are scattered throughout the public areas. Also, many of the guests sit in the public areas and read, or admire the view from the back veranda. For the typical guest who has never been deprived of tech it is jarring at first, but I was surprised at how quickly I adapted to this slower paced environment. It was relaxing and eventually quite charming. Oh, did I mention that it was Native American week? There was a large pow-wow scheduled in a nearby town, and since the park and the hotel are located on the Blackfoot reservation, no alcohol was served at the hotels and restaurants. So, if you were thinking, well, there’s no TV or internet so I’ll just belly up to the bar and soothe my tech withdrawal, think again. The old-timey environment and lack of booze combined to make it seem like you might be staying at the Overlook Hotel from The Shining. You’ll recall that Jack Nicholson’s character fell off the wagon chatting it up with the ghost bartender in the hotel lounge. We only stayed at the lodge one night. Then it was on to Canada. By the way, my apologies for the long absence of posts. I had some things going on that required my full attention for awhile. 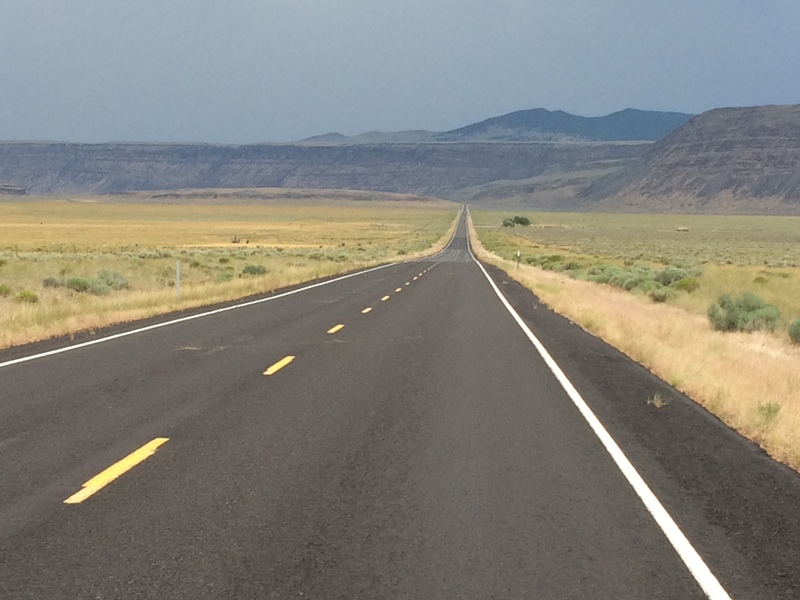 This photo was taken a couple of weeks ago on Interstate 395 in eastern Oregon. As you can see, you won’t have many fellow travelers on this particular road. It’s a good route if you like to drive fast and you’re driving from California to Alberta in Canada. It’s also a good route if you’re driving with your kid(s) and you want to use the drive time to talk with them, because there’s no cell phone coverage at all. No irritating data to distract them. It’s amazing how much you can catch up when their electronics are out of the way. As a single parent I recommend road trips as a way to reconnect. It rained just as the sun was setting, so we stopped the car and caught some good moments, like this one, which I took with the panorama functionality on my IPhone. If you look carefully at the extreme right of the photo you can see the front end of my car, which faithfully executed a 5K (that’s five thousand miles) without any problems. It’s an Inifiniti FX50S, which is somewhat rare. I’ve only seen two others since I bought it in 2012. The main destination of the trip was Calgary, but there were many stops along the way. Why Calgary? Because there’s a very large rodeo there called The Stampede. I have a fond memory of attending the Calgary Stampede on a road trip with my dad when I was about my daughter’s age and I wanted to pass that memory along. I’ll be blogging about the road trip for the next few weeks, along with some other cool stuff. I’ve been on radio silence for the past few months, for reasons I won’t go into. The good news is that now I have a lot of things to write about. Thanks for reading.